FIGURE 12 ■ Laparoscopic photograph of the appearance of the testicle, with the spermatic vessels and the vas dissected. FIGURE 13 ■ Laparoscopic photograph showing the testicle drawn into the cannula. FIGURE 14 ■ Photograph showing the appearance of the testicle as it is brought down into the scrotum within the cannula. the vessels may be transected, in most cases mere placement of clips is adequate. After a six-month interval, a collateral blood supply via the enhanced paravasal arteries develops (Fig. 15). At stage II, cannula placement is identical for primary orchidopexy. If the vessels were not previously transected, they are transected and the testicle is mobilized on the vas (Fig. 16). Great care is taken with the triangle of peritoneum between the juncture of the vas and the distal spermatic vessels. Placement in the scrotum is identical to that already described (Fig. 17). aSuccess was defined as scrotal position and lack of atrophy. FIGURE 16 ■ Laparoscopic photograph-additional clips are placed and the spermatic vessels are divided. FIGURE 15 ■ Laparoscopic photograph of the appearance of the right groin in a child, who had a clip placed across the spermatic vessels six months earlier, and now is back for second-stage Fowler-Stephens orchidopexy. FIGURE 18 ■ Laparoscopic photograph of the left groin in a child with an abdominal medial ectopic testicle. 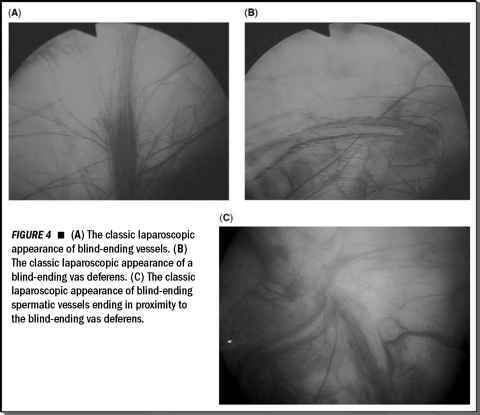 FIGURE 17 ■ Laparoscopic photograph-after dissection to free the testicle on the enhanced vassal vasculature of the vas deferens, the testicle is brought to the ipsilateral hemiscrotum. Testicles having a horizontal lie in the abdomen and often appearing to be "ovarian" on laparoscopy can be quite difficult to deal with. Although no studies examining the histology of these testicles have been conducted, orchiectomy is probably indicated if unilateral. Micro-orchidopexy might be considered for bilateral cases. In the case of normal vessels and vas entering a closed ring, most would agree that some form of inguinal exploration is required and that can be done in most cases from above with a laparoscopic approach. Occasionally, the testicle will migrate intra-abdominally to a medial ectopic position. These abdominal medial ectopic testes are quite difficult to manage because they have short spermatic vessel leashes and also a short vas deferens (Fig. 18). Thus, the advantages of the Prentiss maneuver are obviated. "Micro-orchidopexy" is the term applied to the procedure in which an abdominal undescended testicle is autotransplanted to the scrotum by microvascular techniques. Originally described by Silber and Kelly (36), the procedure was modified by Wacksman et al. (37). Wacksman et al., who have accumulated the greatest experience, recently described the use of laparoscopy to elevate and move the testicle. Then through an open incision, the microcoaptation to the recipient vessels is performed (38). In a small series of what clearly are difficult situations, they report excellent results.